Offering an exceptional combination of refinement, superb driving dynamics and stylish design, the 2016 Jaguar XF in San Antonio TX is an outstanding choice for a midsize luxury sedan. It delivers excitement, composure and comfort and is enhanced with the latest technologies that keep you thoroughly connected and entertained. The new XF received a complete redesign for the 2016 model year, resulting in a lighter, roomier four-door sedan with a better aerodynamic shape and more efficient six-cylinder engine. If you live in the San Antonio area and would like to get your hands on the outstanding Jaguar XF, then we encourage you to contact us here at Barrett Jaguar. The new 2016 XF offers a stunning design with contemporary beauty and progressive styling. Exquisitely designed curves bring the all-new XF model’s assertive character to life. The confident, upright grille and deep power bulge on the hood reinforce its intent. A single, elegant arc runs the length of the body, culminating at distinctive, wrap-around LED tail lamps with F-TYPE inspired graphics, while its sleek, sporty and progressive form, combined with precision underbody architecture is designed to deliver advanced aerodynamic performance. Radiating confidence from every angle, the all-new XF has a look that wants to be driven. The XF's InControl system’s intelligent solutions connect you and your vehicle to the outside world, helping to improve and enrich your ownership and driving experience. And the technologically advanced high-definition Virtual Instrument display combines an outstanding new design, an entirely new graphical interface and more advanced functionality to make driving even more of a pleasure. The cabin of the XF offers an outstanding luxury choice and abundant space. It's Intelligent design and contemporary craftsmanship create an environment that is luxurious and comfortable. Surroundings are brought to life when you push the pulsing ‘Start’ button, followed by a theatrical start-up sequence that gives you a dramatic sense of the excitement to come. With all of the wonderful accessories available from Jaguar, you can personalize the XF according to your taste, lifestyle and interests. Offering four convenient packages (Carbon Fiber, Styling, Lifestyle and Business), you can get accessories like carbon fiber mirror covers and side vents, gloss black mirror covers and side vents, front and rear Splash Guards and a Jaguar headrest-mounted coat hanger. With its high performance powertrain and transmission and stiff, lightweight body structure, the new XF delivers an exhilarating driving experience. The foundation of the all-new XF is an aluminum intensive architecture that provides impeccable ride, handling, and dynamics. This new architecture developed by Jaguar facilitates a near perfect balance, supporting an agile and precise drive. The XF is powered by a 3.0-liter supercharged V6, which delivers an impressive 340 horsepower and 332 lb-ft of torque. Upper-trim models can get a spectacular 380 horsepower version of the V6. The 2016 XF also comes with a wealth of innovative and seamlessly integrated driver assistance features that result in a safer, smoother and more enjoyable driving experience. This includes Autonomous Emergency Braking, advanced parking aides, Lane Keep Assist and Traffic Sign Recognition. 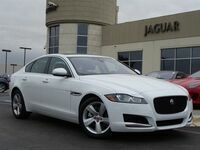 The redesigned 2016 XF is better than even, so if you'd like to get behind the wheel of this spectacular midsize luxury sedan, then be sure to get in touch with us at Barret Jaguar today! Interested in a 2016 Jaguar XF?